Often referred to as CXL, the technique of crosslinking (corneal collagen cross-linking) is proposed to the patient to increase the stiffness of the cornea in case of keratoconus Evolutionary. Despite its growth in ophthalmology in recent years, no significant increase in corneal stiffness could be demonstrated in patients using this technique, whatever its type of realization (removal of the epithelium: Epi off CXL, non-removal of the epithelium,: Epi on CXL, or diffusion by iontophoresis of riboflavin in the corneal stroma) , etc.). This should be enough to make the Controversial CXL. It is legitimate to issue a doubts when its real effectiveness on corneal Biomechanics and to discuss his interest in the management of Keratoconus (see here), as well as this Article written in the light of very recent data. If the crosslinking fails to harden the cornea, its effect on corneal topography is mainly the result of SCAR changes of the corneal surface (remodeling of corneal epithelium). It is relatively small in magnitude and clinically significant (one to two diopters). These facts which should stimulate critical thinking, and question the scientific rigour put into play to judge the merits of the realization of the corneal crosslinking in human clinic, are gathered in a Recent publication. What did the cross linking? Cross linking (or CXL) is a chemical reaction that aims to create covalent bonds between atoms or molecules (e.g., polymer chains). These additional bindings between the atoms concerned (referred to as collagen cross-linking) then in principle provide increased stiffness to the material or treated fabric. Like any chemical cross-linking reaction (creation of interatomic bonds), it requires an energetic input (ultraviolet light in the case of the corneal CXL), a substrate, and time. The vulcanization of rubber, or the creation of polymers used in dentistry are examples of realization using cross linking. The goal of the cross linking is to harden the treated fabric. The technique of "crosslinking" thus requires an energy intake that can be made in the form of heat or radiation by particles (ex: electrons, or photons). Also some reactions require the addition of a chemical agent (molecule): "cross linking agent. More energy and substrate, the cross linking takes time. Finally, changes in the mechanical properties of the substances "cross linked" depend on the density of links created. The thickness of the corneal wall consists of two main tissue layers: epithelium, on the surface, which is a stratified cluster layer and the stroma (composed of interlaced collagen lamellae). Collagen fibers are themselves made up of different types of collagen fibrils. In the case of the cornea, the crosslinking reaction aims to achieve additional chemical bonds (Covalent bonds) between the fibrils of collagen in the corneal stroma. It is important to bear in mind that before anything else, the Crosslinking is a technique thought and designed to harden corneal collagen. Its effectiveness must thus be judged on the yardstick of this reinforcement. There is currently a drift to present the CXL as a technique capable of inducing some corneal remodeling, beneficial to the vision of the patients operated. The study of literature reveals that the Visual benefit of cross linking is low and not significant With regard to degradation inflicted by corneal deformation. On average, the resulting camber reduction does not exceed one-and-a-half diopter, and is due to scarring of the cornea (epithelial regrowth). The crosslinking technique for corneas with Keratoconus was originally proposed by the team of Dr. Theo Seiler (Zurich, Switzerland). It requires the addition of a molecule of Riboflavin (also called vitamin B2) and irradiation of corneal tissue by ultraviolet photons A ()UVa). Riboflavin must impregnate the corneal stroma; Irradiated by UVA (particularly energetic radiation), this molecule generates free radicals containing oxygen, which would be responsible for the creation of covalent bonds. Oxygen radicals (e.g. peroxide, oxygen ions) are highly reactive because they have free electron pairs; These electrons are then available to form covalent chemical bonds. However, they are responsible for a oxidative stress, and are Toxic to living cells like the kératocytes of the corneal stroma. The intimate chemical mechanisms put into play by the corneal cross linking are not yet accurately known. If the solidification of the cornea has been measured in vitro (on animal corneas, laboratory) no increase of corneal rigidity has been measured vivo (on human corneas, treated for a keratoconus). This point for the least surprising, and which should lead to questioning the real effectiveness of cross linking, will be developed infra. It may be trivial to mention that The CXL reaction itself stops as soon as the corneal stroma impregnated with riboflavin is no longer irradiated by UV-A (i.e. when the UV lamp is turned off, usually after 30 minutes, but there are variants and forms of CXL that are called "accelerated"). However, some relate the late topographical variations with the collagen cross-linking procedure itself. This could be a form of Magical thought", but in reality, late changes in the curvature of the cornea (late and modest, far from what should be obtained to regularize the geometry of the cornea and make the keratoconus disappear) are linked to Non-specific scar remodeling phenomena. These kinds of scarring variations are observed in many corneal surgical procedures, or various ailments such as infections, interstitial keratitis, etc. The classic technical achievement of the crosslinking requires the removal of the epithelium of the cornea (such as in surface laser refractive surgery or "PKR"), and the impregnation of the underlying stromal tissue (the thickness of which must be at least 400 microns) by riboflavin. Drops containing riboflavin in suspension are instilled at regular intervals for 30 minutes. A ultralviolet radiation (360 nm, 3 MW/cm) is then delivered at a distance of 5 cm on the bare corneal stroma. After the intervention occurs a superficial epithelial healing phase. This Healing certainly explains to her only topographic changes measured after cross linking (Opinion of the author of this site which derives from the logical arguments mentioned above, and that many clinical and experimental results reinforce). In fact, one observes for example the same type of change after procedures to therapeutic target (PKT: This technique also involves the removal of the epithelium, followed by the application of a superficial photoablation of a few microns, and an epithelial scarring that is of magnitude comparable to that which can be observed after CXL, in a context less inflammatory, however). While the goal of the CXL is to stiffen the cornea (which is unfortunately not obtained in clinical practice), the existence of changes (topographic)weak(, of the order of 2 diopters) allows developers of this technique to convince himself of his 'efficiency '. More recently, techniques consisting of to permeate the cornea of riboflavin without removal of the epithelium have been proposed (ex: iontophoresis, which allows you to migrate the molecules of riboflavin through the epithelium under the action of an electric field). Their effectiveness seems as bad on the corneal rigidity than the classic technique with desepithelialisation, but the changes observed in terms of corneal topography are also this time not significant (the absence of withdrawal of the epithelium probably explaining the modesty of the results observed in the corneal shape change). These results strongly suggest that theEs epithelial changes explain the topographical changes observed after CXL, which are therefore not specific to this technique, and would also occur in the course of any technique involving removal and regrowth of the epithelium. If the cornea is particularly thinned by the evolution of keratoconus, cross linking may be toxic to the endothelial cell layer. These cells are located at the deep face of the cornea and charged with keeping the corneal tissue in a state of relative dehydration. The'Activating free radicals in the deep layers of the cornea can be a source of endothelial cell death, with the risk of corneal edema. An éSufficient minimum thickness of cornea must be measured before proposing a CXL. It should be pointed out that the cornea is generally finer after the cross linking is attained, which is not a guarantee of the efficiency of the technique. Finally, variations consisting of a cross linking accelerated, where UV radiation is more intense but brief have been proposed: their effectiveness is comparable (anywhere on the Biomechanics of corneal, partial on the topography of the corneal surface); they are essentially designed to simplify the operating procedure but do not bring not much more that the classic technique. The long-term effects of cross linking are still unknown, as well as the sustainability of the hardening effect envisaged, as there is a physiological corneal remodel. If you believe in the effectiveness of the crosslinking, it makes sense to offer part of Keratoconus SCALABLE, Since the issue claimed by this technique, because they cannot demonstrate an any hardening is to slow down the evolution of Keratoconus. From the point of view of the author of this site, Keratoconus is probably linked intimately to the realization of repeated eye rubbing, who are more likely to explain the corneal deformation that dystrophy involving purely Biomolecular mechanisms. One external mechanical force (friction) seems necessary at the outbreak of the disease, and to stop its progression, it appears logical to do more exercise (stop rubbing your eyes). Unfortunately, there an abusive tend to offer this technique from the discovery of a beginner same Keratoconus. Similarly, improper indication of cross linking are unfortunately sometimes found, for example in patients over 30 years, for which the evolution of Keratoconus is null,.. .except well heard if patients continue to vigorously rub the eyes. Proposing a cross linking after 35 years does not fall under any scientific evidence because the keratoconus is little or more evolutionary (... it is unfortunately very possible that one day it is the same regardless of the age of the patient). Indeed, a balance between the mechanical stress (frictions) and the loss of elasticity of the corneal tissue is reached. This may be different for rare and late forms of keratoconus, which sometimes occur when the patient concerned began to rub his eyes very frequently and vigorously in adulthood (occupation exposed with eye irritants, very prolonged work on screen, appearance of marked dryness of the eye, etc.). The argument opposed by supporters of the cross linking against abstention is that"Please do something"... However, cross linking does not have the characteristics and safety of a placebo, as this technique is potentially aggressive for corneal tissue. The crosslinking consists of a powerful oxidative reaction, of which we know the potential deleterious effects on biological tissues, and whose rate of complication is far from negligible, ... as well as the cost to the patient. The argument put forward is that if the lenses or some procedures are able to restore all or part of the visual function, It is necessary to stop the evolution of the Keratoconus. The patients who are legitimately worried and uninformed are very sensitive to this speech and are very positive about the realization of a technique supposed to stop their disease and are willing to disburse sometimes consequent sums for it. In fact, patients with keratoconus, and their loved ones, are often very worried, and seekers of an intervention that could if not cure them, at least curb the evolution of the disease, which explains the ease with which this technique of CXL is accepted. As underlined by the reference study of the Cochrane Bookstore published in 2015, however, there is No studies able to demonstrate that the CXL delay the cornea transplant. The published studies do not have a statistical value because there is no control group, and the evaluation criteria used for the monitoring of keratoconus are insufficiently accurate. That the realization of the CXL delays the graft is a view of the mind, and sometimes a bias related to the fact that the doctors who realize the CXL naturally delay the indication of a graft to the discourse of it. Furthermore, it is possible that a beneficial effect of the CXL is to stop the eye rubbing: But the latter can and should rather be obtained without it being necessary to carry out a relatively invasive gesture for a corneal tissue already put to evil by the repetition of a mechanical trauma sometimes violent (especially for patients who rub with the hard part of the knuckles of the fingers). The scalability of the keratoconus must be confirmed by the corneal topography. The realization of good quality topographical and tomographic examinations is crucial: it is preferable to perform several measurements at each visit because the repeatability of the topographic measure is lower in case of keratoconus. In addition, the scalability of the keratoconus must be judged on a beam of criteria, and not a single topographic criteria Like the simulated keratometry (SIM-K). At best, a differential topographic map, which is a relatively easy to interpret objective examination. It is not lawful, even if one is convinced of a speed bump effect, propose a crosslinking during the first visit after discovery of a Keratoconus regardless of its stage. There are indeed non-evolutionary forms of keratoconus, in particular the infra-clinical forms (including the Keratoconus fruste). These forms are often encountered in atopic patients, who have rubbed their eyes at certain periods of their existence and have stopped or severely reduced these frictions. In proven forms of Keratoconus. It doesn't help (for the patient at least) to a cross linking If the Keratoconus evolves more. Repeat that after 30/35 years, the majority of the Keratoconus no longer evolve (except for repeated vigorous rubbing of the eyes). Conversely, repeated eye rubbing practice can quite provoke a deformation (often called "ectasia" of the corneal wall) and even after 30 years. Rather than prescribing a CXL in haste, and presenting this need as "urgent", it is crucial to explain to the patient that it is absolutely necessary to stop rubbing the eyes, that are very often (always?) patients with Keratoconus. Patients should also be questioned about how to sleep and to avoid prolonged eye cuts at night (patients sleeping on the belly or on the side, head in the pillow, in orbital support on one hand or forearm, etc.). Some times of the day are conducive to often unconscious friction: in the morning when waking up, in the shower, in front of the screen (work supported), in the evening at bedtime. The make-up is sometimes carried out in a somewhat "violent" way for the corneas, and it is often observed in women who remove their makeup with vigour some contact deformations (usually little pronounced, because the gesture is performed only once a day). Rigorous monitoring of patients with Keratoconus teaches that stopping friction is enough to stop the evolution of the keratoconus. This reinforces, if not, demonstrates the hypothesis of a causal mechanism of eye rubbing. This assertion can be simply verified by consulting the case gathered on the site Defeatkeratoconus.com. This unique collection of unsorted observations provides eloquent examples of the role of friction, of the sleep position, in the genesis of the Keratoconus, and of the beneficial and stabilizing effect obtained by the simple cessation of these frictions (case are available Here). Finally, a minimum of objectivity and scientific spirit should lead to realize that the results of the cross linking are questionable, in particular on the biomechanical plan (see below "") The crosslinking in question« ). The methodology used in the studies to evaluate the cross linking does not assert the superiority of this technique on a "placebo", or even the absence of any therapy to freinatrice aiming! Many forms of Keratoconus are not spontaneous progression beyond some time of evolution, in the absence of repeated local trauma (always eye rubbing). It is absolutely true thatin VITRO, there is a "hardener" of the crosslinking effect: it is generated for animal or free of Keratoconus corneas. But in VIVOthe hardener of the crosslinking effect could never be highlighted, which is for the least surprising because the crosslinking has as purpose than to crosslink the corneal stroma to modify the visco-elastic properties. The measurable effects of the CXL could be that induced by a epithelial remodeling (rather than anterior stromal), that is to say a superficial scarring reaction. There is also often a more or less discreet clouding in the superficial anterior stroma, which can induce Visual discomfort to fog type called "haze". Corneal opacity superficial, located in the anterior stroma under epithelial, after carrying out a cross linking for Keratoconus. Depending on the importance of the opacity, simple Visual discomfort or greater functional disabilities can be observed. 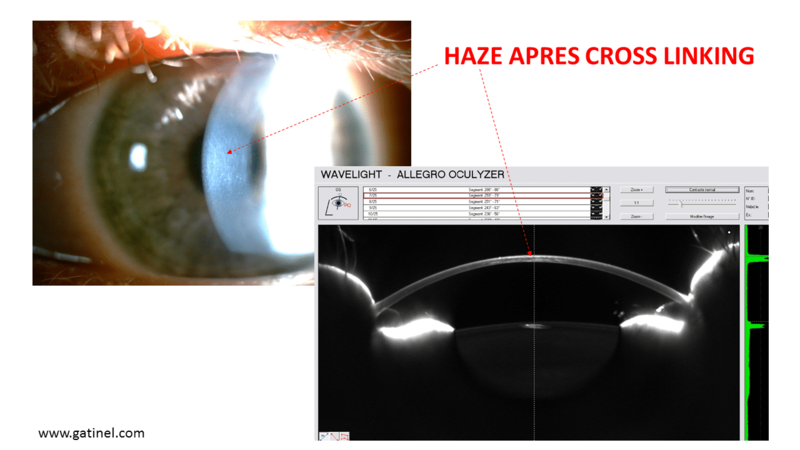 Example of haze (diffuse corneal opacity) after making a cross linking in a matter of 22 years, from the discovery of a Keratoconus linked to the eye rubbing repeated. After CXL of corneal collagen, some late flattening case (reduction of corneal curvature) were reported, but they are not specific to this technique And were also reported after episodes of keratitis or inflammation of the cornea stroma. Changes in corneal curvature observed after CXL (most often of low amplitude, 1-2 D) are probably related to Scar reshuffles of the most superficial tunic of the cornea (epithelium), and do not have much to do with the consequences of any hardening of the corneal stroma (which has never been measured after this technique in vivo, whereas the solidification of the cornea is the raison of a cross linking technique!)). The Keratoconus is often associated with (most likely caused by) to repeated and vigorous eye rubbing (made with the phalanges, harder than the pads of the fingers), aggravating the distortion and ruptures between the collagen fiber linking corneal slats, and creating (supposed) of Covalent chemical bonds can probably not truly repair the real natural links, or restore the harmonious spatial organization of the collagen fibers. The author of this site is convinced of the need for external physical trauma to explain the onset and evolution of Keratoconus: eye rubbing repeated are frequently complained, but in some rarer forms, night compression extended by hand or pillow seems associated with forms United or bilateral Keratoconus (the "hugging pillow" syndrome). Patients who sleep on their stomach or side are more exposed to this form of Keratoconus. These Keratoconus usually have a particular topography (marked peripheral camber). Subtract the corneal dome at the physical external factors likely to jeopardize the biomechanical rigidity is the first step to consider when the discovery of an evocative form of beginner Keratoconus, or a proven Keratoconus. The termination of the eye rubbing (or any trauma repeated on the corneal dome) is enough in my experience based on monitoring of hundreds of eyes to stop the evolution of Keratoconus. It is never urgent to perform a crosslinking. It may not even be appropriate to do so. -Never forget that you can stop the evolution of the corneal distortion by never rubbing your eyes vigorously. It's not your fault if you have a keratoconus, information about the eye rubbing and their dangers is unfortunately almost non-existent outside this site and a few others. The ophthalmological community as a whole continues to consider the keratoconus as a genetic disorder whose mechanisms are misunderstood, and that the disease of the ocular tissue is linked to local constitutional and/or inflammatory phenomena. It is difficult to combat the certainties that have been inculcated for decades, and it will take time to evolve the understanding and acceptance of the mechanical character of the keratoconus. Many teams are dedicated to the search for genes, molecular mechanisms that could only explain the disease. It is not necessarily easy for researchers involved in the search for pointy biomolecular mechanisms to admit that corneal deformation may simply be the result of repetition of local trauma (friction): However, this explanation is the most obvious and able to account for what is encountered during the keratoconus. – The critical arguments developed against the CXL are supported by logical findings and it is entirely possible to verify in the medical literature (see the link to the article in English). If your ophthalmologist has strongly recommended the CXL, it is very likely that he did so by being convinced of the benefit of this technique. Take several opinions, and use your critical mind. – this page does not promote any competitor or alternative product. No more rubbing your eyes costs nothing, if it is sometimes a lot of willpower. If you believe in the merits of the CXL, its realization, however, is not possible to propose it for all patients, and there is against conventional signs for the CXL. In case of thin cornea, the risk is that endothelial toxicity (the endothelium is the deepest layer of the cornea: his injury caused an irreversible oedema), do not realize cross linking If the affected cornea in Keratoconus has a Center thickness less than 400 microns at the Center. Any active scar lesion is also a contraindication. Finally, remember that the cross linking is not indicated in case of no evolutionary Keratoconus, and in case of progressive form, is it necessary to check that evolution continues even when the patient stops rubbing the eyes. The realization of a cross linking with the discovery of a Keratoconus in an adult is often an indication of abuse. Some medical recommendations suggest to propose a CXL to any patient young (ex 18), before checking the Keratoconus progresses. In the (extensive) experience of the author of this site, the eye rubbing strict stop to stop evolution of Keratoconus. On the other hand, and despite the linking cross, Keratoconus is still progressing when it rubs his eyes. The clinical results suggest the occurrence of a stabilization (but not a regression or healing) of Keratoconus and corneal ectasies. Actually, the number of published studies are of insufficient to demonstrate a statistically significant the CXL jams evolution of Keratoconus. Cross linking does not allow healing of Keratoconus; even if the studies were sufficiently robust, limited in time of this technique back would not yet say that there is a stabilizing effect of the cross linking to medium and long term. Moreover,. There are many no evolutionary forms of Keratoconuswhich does not necessarily conclude the effectiveness of cross-linking in case of stabilization after realization of this technique. In particular, the strict eye digital friction stop just in most part of the case to stop the evolution of Keratoconus in young adults. Repeat in the echoing of the Cochrane study, onlyNo well constructed statistical studies to demonstrate that the CXL stops more evolution of Keratoconus than the judgment of the eye rubbing, or spontaneous evolution that would have had the disease in the absence of treatment. Topographic changes (comparison of corneal topography before and after cross linking) have been observed. initial increase of camber (linked to the removal of the epithelium and the likely unmasking of the geometry of the layer of Bowman) before later reduced it. However, this reduction is low amplitude in terms of deformation caused by Keratoconus (a little less 2 diopters on average, while Keratoconus can increase the keratometry 10 to 20 diopters). In a recent study, the Central corneal curve (keratometry) and theastigmatism corneal declined 0.16±2.20 and 0.10±1.69 D)see the summary of the study). Improving vision is on average close to a line of best corrected Visual acuity and modest. These results are comparable to those that could be hope in stripping the cornea of his epithelium, by creating a local inflammatory reaction, and observing the effects of epithelial growth over the cornea. The complications of the cross linking have been reported: local inflammation (haze), infections corneal (corneal abscess), and lesions endothelial (the endothelium is the deepest layer of the cornea, which can cause an irreversible oedema). In the most serious case a melting stromal (Central necrosis of the cornea) may be observed. The reported rate of complications is generally between 2 and 3 percent. Still emphasize an important point and too often overlooked: there is a technique simple and devoid of risk (and the financial cost is zero for the patient...) to avoid advancing a Keratoconus: convince the patient to stop rubbing your eyes. Some case, after stopping eye rubbing, observed some regularization of the cornea curve (small amplitude, about 1d, but which appears to be real and not related to fluctuations of measures, and probably related to the reduction of Inflammation induced by friction and some epithelial regularization). The repeated and vigorous eye rubbing are a cause proven scalability for Keratoconus, which often causes an overwhelming urge to rub the eyelids, as tears spread less well on the distorted cornea, there are inflammatory factors associated with Keratoconus at the level of the ocular surface. These data support the questioning of the effectiveness of the cross linking. The Cross-linking of corneal collagen has been Designed to solidify the cornea Patients with Progressive form of keratoconus, but no evidence of corneal hardening has ever been observed in patients with keratoconus who have undergone this technique. Proponents of the latter usually reject the lack of evidence of clinical efficacy on measuring instruments, which would not be sufficiently effective to measure this hardening. These instruments perfectly measure the corneal "softening" following the presence and evolution of a keratoconus, or corneal surgery, or a corneal pathology responsible for reducing the corneal stiffness (e.g., corneal edema). If the cornea hardened significantly after CXL, this hardening would be highlighted, at least in a trendy way on large numbers, under the basic principle in physics of reversibility of a phenomenon with the arrow of time. The stakes of the CXL shifted towards the supposed stabilization of the keratoconus, and the reduction of the central curvature of the cornea. There is no well constructed statistical study to validate the formal evidence of a slowdown in the evolution of keratoconus, as there are many spontaneously non-evolutionary forms. The studies focus on small samples, without a quality control group, without taking into account the lesser repeatability of measures to judge progression and/or Al stabilization. The results of these studies are unfortunately interpreted with a bias characterized by a priori favorable, without the effectiveness of this technique being questioned: when the expected results are not at the rendezvous (no hardening measured), the authors blame the measuring instruments considering that there is necessarily a hardening, but that it is not measurable. I leave it to the reader to appreciate the scientific value of this type of interpretation. The changes observed after CXL with respect to the alteration of the corneal curvature are Low amplitude and non-specific, related to the Remodeling the epithelium of the cornea. The relative success for the practice of this technique of CXL in patients with Keratoconus is explained by the request of these patients, anxious once the diagnosis has been made, as well as the "economic" aspects of the gains it generates in the industrial (sale of riboflavin and consumable ampoules) and of course the surgeons (most believe in the virtues of the CXL , but some refuse to question its effectiveness when it is challenged, and sweep away from a hand of the striking, simple and obvious arguments. Inefficacy of CXL techniques by iontophoresis, yet quite able to penetrate the reactive agents in the cornea, and which should react to UV radiation which easily crosses the epithelial layer. 109 responses to "Crosslinking (CXL)"
45 years old today, a keratoconus was diagnosed in 2011 in a private clinic in Paris. Since regular checks have shown its evolution, the disease has been reclassified into marginal pellucida degeneration. In my last review of April 2015, I was offered a cross linking to stop the evolution of the disease. After reading this article as well as this one ' the questioning of the actual effectiveness of cross linking. I admit that I ask myself a few questions, is the game worth the effort? Should I not just try at first to wear rigid lenses or possibly get me to install intra-corneal rings. The few published studies on the interest of the CXL in pellucid marginal degeneration (DPM) of the cornea cannot conclude. The DPM is a condition that differs from Keratoconus by many points. She seems not related to the occurrence of eye rubbing repeated (although these can of course make it worse). It concerns the very lower part of the cornea, near the lamina (the junction between the cornea and the sclera, which is the wall of the eye). This thinning causes a change of the corneal dome and very characteristic images in corneal topography. The DPM is sometimes confused with Keratoconus and vice versa (the Keratoconus with a lower apex provide a close enough picture of the DPM in anterior topography, but in the DPM, thinning is much more peripheral, and see you at the examination of the eye to the biomicroscope - slit lamp). The DPM is probably a local immune dysfunction, as other corneal diseases that cause a thinning of the periphery of the cornea. The correction in glasses or rigid reverse astigmatism lenses is the first thing to do. Before "CXL epidemic" and some derivatives can be 'commercial', considered that the cornea was "rigid" by time, and that there was nothing to make a CXL after 35 or 40 years. It is surprising that this technique is proposed in first intention for a condition whose mechanisms are unsolved and that the mode of action may be paradoxically toxic (keratocytes loss). The corneal rings are deprecated in case of DPM, because the cornea is thinned out on the periphery, not in the Center; laying those above don't's would design after the failure of an adaptation in rigid lenses. Thank you for your very quick response and I will get closer to my ophthalmologist to try an adaptation to the rigid lenses. What worries me is that I may not tolerate them. About twenty years ago I had told me that I did not have enough tears. In this hypothesis and given that the correction of astigmatism by the glasses seems to have reached its limits, I wonder how my mink that is deéjà not excellent will evolve in the future. I will therefore try to make an appointment at the Rothschild Foundation to submit my last results (ORBSCAN), perhaps you can enlighten me more about the situation and advise me. (Their lack) tears are not a major obstacle to adaptation in rigid lenses (the material of which does not absorb the tears); in DPM, the geometry of the front of the cornea to choose parameters of the rigid lens. The correction of astigmatism in glasses is generally uncomfortable beyond 3 or 4 diopters, because of the particular distortion than occaseionne these glasses. Rigid lenses 'absorb' much better astigmatism, since they are in direct contact with the cornea. You are right when printing critical towards the CXL to reading this page. Evidence of its effectiveness on progression have not been made, as a meta analysis (an analysis which analyzes the results of studies published on a specific point, in this case the efficiency of the CXL fine and unbiased way) published recently (Cochrane database). Better, the CXL is thought and designed to harden the cornea. However many articles show that this hardening is not measurable after CXL... a combe. The rest is literature and financial interest, probably, because otherwise it's a challenge to scientific and critical mind. I am dozens of patients with keratoconus for many years and the judgment of the eye rubbing is enough to stop the evolution of the keratoconus. The effects of the CXL (modest) are related to healing induced by the inflammatory response caused by cross linking. The technique d iontophoresis merit to preserve the epithelium but because of this, studies shows that she does not really measurable change or benefit (other than pecuniary). I am 27 years old, after consulting with a ophthalmologist in 2013 we discovered a keratoconus at the level of my right eye and this year I was told that the Keratoconus begins to appear at the level of my left eye and that it is evolutionary. So I was told that I have to do a cross linking the rather possible. Actually, I've been doing cross linking and this for 17 days. The worries I have today is that after cross linking and up to date, I see poorly and blurry whereas before the intervention I saw clearly with both my eyes and I had no worries despite that I have a keratoconus advanced on the level of my right eye. During the two post-intervention checks, I expressed my concern to my doctor and he told me that it is normal and that I need time to recover. Sincerely I fear that it will not happen and I ask you to explain to me what happens to me; Is that actually normal and I'm going to recover or else the linking can cause this kind of effect (view regression)?? The classic cross linking requires the removal of the corneal epithelium, which is a superficial layer of the cornea. In case of keratoconus, this layer usually has a particular distribution which aims to regularize the surface of the eye. After the CXL cornea must restore this layer, and before this process is complete, "laid bare" deformation by the procedure causes a reduction in vision. Furthermore, the effects measures after CXL arise in my opinion solely from this regrowth of the epithelium which stimulated, can cause a slight reduction in the corneal steepness and give the illusion of a change that is not bound to effect long-term biomechanical (the CXL fails to harden the cornea while it is thought and designed for this). Finally, other causes of low vision are possible after cross linking like the haze, which is an inflammation of the cornea. I did a CXL nearly 3 months ago however I notice a reduction in vision blurred in fact vision as a su veil eye is - it of something dangerous is it going over time. I await your response, I am very worried. It is likely that this veil is related to the presence of an inflammation of the cornea. In the case where she is most pronounced, one speaks of "haze" (mist in English). In general, the haze peaks around 3 months after the cross linking. It tends to disappear with time but can persist. The persistent haze is one of the complications of the cross linking. Hello jai 20 years my ophtalmolo has detected me a very advanced keratoconus. He talk about a transplant, what struck me much worried, I have therefore taken appointment with a specialist in the keratoconus. He my so told to do a cross linking. It worries me a lot, I'm afraid of losing the vision in my eye. I also detect a beginning of keratoconus has the other eye. I am much worried! In your case, you have to stop rubbing your eyes and redo a control in a few months, then it is likely that there will be no evolution. The wearing of a rigid lens should be the first option to consider. In case of failure and case of severe distortion, opacity of the cornea, it may be useful to consider a corneal graft, but not before trying to adapt a lens. A minimum thickness of 400 microns is recommended to perform a cross linking. It is not necessarily very harmful to escape the cross linking If you read the pages devoted to this technique on this site. On the other hand it is important or even crucial you would totally stop you rub your eyes. If you do, your keratoconus will not progress. Patients who have had a CXL tend to not rub the eyes (or the eye if the technique is unilateral) because those are sensitive due to the inflammation that causes the CXL, and which is accompanied by a hypersensitivity of the corneas. Those who continue to show a progression of the keratoconus. Contrary to the proponents of this technique, no scientific evidence of its effectiveness could not be demonstrated (published studies have no value dixit study Cochrane which is an authority in the field of evidence-based medicine). In the absence of medical technology alternative in view of the concern of patients and the economic interest represents the CXL for those who practice it and distribute the instruments and consumables dedicated, this one continues to be carried out on a relatively large scale. But even once, no more rubbing your eyes is enough to stop the spread of the keratoconus in my experience based on hundreds of patients with keratoconus of various stage track (with the necessary and sufficient cause from my point of view the friction of the repeated and eyes caused by allergies or irritants of any kind). Thank you very much for the article. I am 31 years old and I actually had the bad habit of rubbing my eyes especially in allergy period. I discovered that I had a keratoconus for a few months, I stopped since rubbing my eyes. I tried to wear rigid lenses, my eyes have them well tolerated on the other hand I stopped wearing them because they are not practical in addition I see pretty well with the glasses and C well enough for me. is the port of the lenses obligatory to prevent the evolution of the keratoconus? Or they just serve to see more clearly. Hello, thank you very much. This article confirmed my findings after a cross-linking to my left eye. The cross-linking took effect of worse my eyesight. In my childhood and adolescence I tended to rub my eyes a lot. The drought. But to try to dissuade me from rubbing them even when the irritation is great I tell myself that with every rubbing it is 0.01% of my view that I lose. In any case again thank you for sharing your knowledge in this article. I live in Morocco and here doctors treat us more like customers/consumers than patients they often put pressure on us to follow their diagnoses blindly. What is on now is that my right eye will never suffer from crosslinking and that I will do my best to stop rubbing my eyes. In any case again thank you to you. One last little question: is a career in computer science conceivable for someone with this (disease/deformation)? Thanks for this shared experience. There is anyway never urgent to achieve a cross linking. Keratoconus evolves not a day or one week on the other... and do not rub the eyes enough to not to aggravate the disease. All the cross-linking have no pejorative implications of the vision, fortunately. Unfortunately, this technique tends to be proposed in first intention, from the discovery of Keratoconus, and well before in support of evolution. 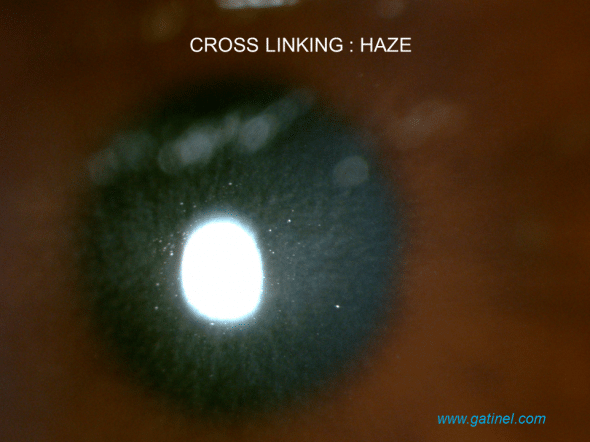 Cross linking is thought and designed to "harden" the cornea. No clinical evidence of this hardening could be demonstrated in human eyes with Keratoconus ("In vivo" studies), and it would be surprising that despite this failure in principle, a real stabilizing effect could be achieved. Patients with CXL keratoconus tend to be less or more rubbing their eyes, and the epithelial remodeling induced by the CXL technique is largely sufficient to explain the topographic changes observed a priori. Lenses do not slow down the evolution of Keratoconus. If wearing glasses just to clarify your vision, it is not necessary to wear lenses. I have a diagnostic bilateral Keratoconus in 2001 (born in 1980). I don't ever rubbed eyes strongly (in all case in the memories I have since adolescence). Since I had knowledge of this disease, I don't do dogs pretty much never eyes. I couldn't stand the hard lenses. Evolution of Keratoconus has continued. I have always followed with regular topographies. I underwent a CXL operation at the end of 2013 (at 33 years old) on the right eye (the one that was still evolving, weakly I think). The operation is apparently unfolded correctly. I never felt any benefit at the level of my eyesight (it was not the goal). The keratoconus on the right eye stabilized (it was already the case on the left without CXL). I work mainly on a screen. For a few months I have seen a sharp decline in my eyesight (right eye only). Last control carried out in February 2015, I was told it was myopia. Reading with my right eye only (with bezel) becomes very difficult. Can you tell me if there is a cause and effect between CXL and decline of myopia? What are the solutions offered to me to alleviate this problem? It is difficult to give you specific elements without detailed ophthalmological assessment. The accentuation of myopia is initially linked to your Keratoconus. This pathology is responsible for (among others) an elevation of the curvature of the central cornea. This induced an increase of nearsightedness, and astigmatism in optical terms. It would be interesting to perform a corneal topography and compare it with those that have been made in the immediate aftermath of cross-linking. Although this may seem surprising given the place occupied by the technique of cross-linking to many practitioners, none of the studies is strong enough to prove that the CXL slows down evolution of Keratoconus (this is the conclusion of the meta-analysis of the scientific authority in this field, the Cochrane Library). The effects measured after cross linking are probably (and only) related to healing of the corneal surface phenomena. In my experience, these are the eye rubbing (and to a lesser extent certain habits such as sleep on your side with a pillow or hand based on the eye) which explain the occurrence and worsening of Keratoconus. 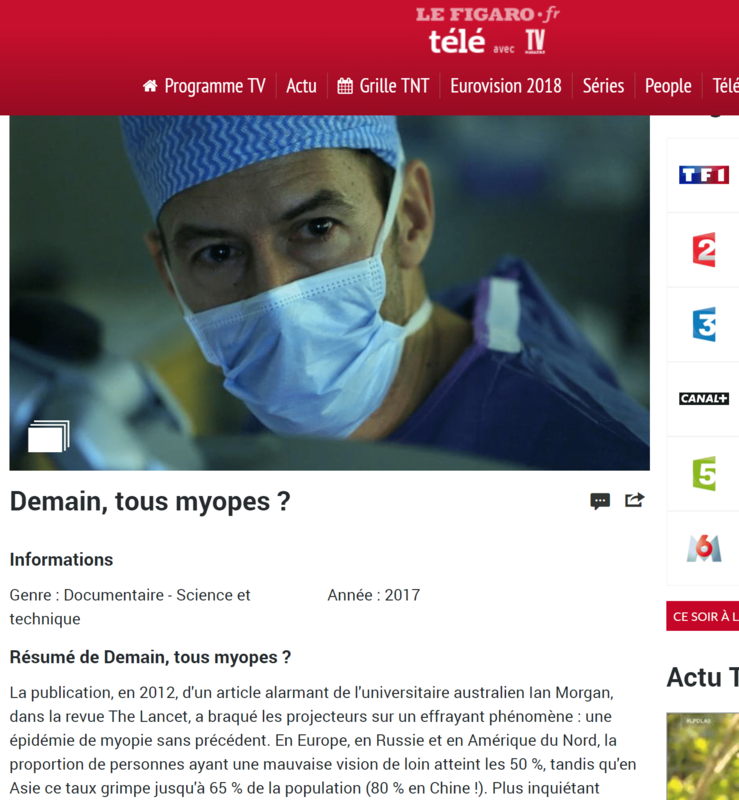 Other causes of late myopisation are rare and not necessarily related to Keratoconus. The occurrence of a nuclear cataract is often at the origin of the appearance or emphasis of myopia. A detailed ophthalmological assessment can certainly tell you, the most effective and the least invasive solution for your lens correction is the adaptation of rigid lenses. Recently, "hybrid", hard to the Center and soft lenses on the periphery, have been proposed and seem likely to be better tolerated locally. Hi I was diagnosed with advanced Keratoconus my eye doctor told me that at this level a Cross Linking is risky, so better to prescribe the lenses but my parents don't want lenses and prefer that I wear glasses. Regarding the positions to sleep my ophthalmologist says that I can sleep on the side while you doctor you said that even on the sides its still dangerous otherwise sleep just on the back is not easy too painful. You can sleep on your side as long as the position of your head misleads no risk of prolonged ocular compression (support of the eye and orbit on the pillow, hand, etc.). It is important to not over rub your eyes if you don't want your Keratoconus progresses. Contact lenses are certainly the best way of optical correction of Keratoconus, and try to get the consent of your parents, talking with your eye doctor for example. I live in Quebec (Canada). I am 19 years old. I was diagnosed with Keratoconus to stage early-moderate in January 2016. I vigorously rub the eyes since I was a child, due to my allergies. I (as I don't) the bad habit of sleep with hands in front of the eyes to block the light. To start, I was referred to a special eye for crosslinking treatment clinic. Yet, we never checked if my Keratoconus progressed. Since my diagnosis, I rub more eyes and I stopped my nocturnal habits. I was told that it was very rare that Keratoconus developed with one eye. Yet, the left eye, I see 100%. According to you, should I use to the crosslinking in the coming weeks as I was told? Do you think my Keratoconus can continue his progress even if I stop the rubbing of my eyes? I was also told that I was born with Keratoconus, someone in my family had the same thing but we don't know that and that the rubbing of the eyes caused the development of Keratoconus. Do you think this disease is actually genetic? Finally, can we lose sight due to Keratoconus? 1) that the keratoconus will inevitably progress. 2) that cross-linking slows down or stops the progression of the keratoconus. Regarding point 1), my clinical experience every day in patients who stop rubbing your eyes (or compress them overnight in his sleep), Keratoconus progresses more. I think that Keratoconus, to appear and progress, requires a traumatic factor. In other words: "no rub, no. cone! Even in young patients, the stop of the traumatic element is sufficient to stabilize the evolution of Keratoconus. There is never urgent by the week or month to achieve a CXL, as evolution of Keratoconus is on a longer time scale (when the traumatic factors persist). Patients who present with severe forms of Keratoconus (with corneal opacities and major deformation) are always those which are more vigorously rubbing the eyes. Finally, the topographical criteria for Keratoconus are often insufficient, because between two successive measurements of a same cornea, there is a variability that is most important in case of Keratoconus, and assert an increase (or a "regression") requires greater changes than what is generally accepted (an article will soon be published on this topic). Regarding point 2), studies that suggest a stabilization of Keratoconus by the CXL are skewed by a small number, and above all, the absence of control group and long-term follow-up. The action of the CXL is indirect; This technique fails to harden the cornea (which is why it was designed) but causes a scar remodelling (like any technique which would include a withdrawal of the followed epithelium of an oxidative chemical physical action). Changes topographic post CXL (slight flattening, often few significant clinically) are not related to a regression of Keratoconus as you might think with a bit of credulity, but to healing which, at this scale, enough to cause minor changes such as a reduction of one or two diopters of the Central keratometry (corneal curvature Central). The cornea is made up of two main layers in terms of thickness: (the "body" of the cornea) stroma and epithelium, which is a superficial layer of cells. In the evolution of Keratoconus, the deformation is mainly the stroma. It deforms under the action of repeated physical stress that eventually affect the harmonious structure of the fabric of the stroma, which is made of interwoven strips of collagen. The CXL causes a major inflammatory reaction of the corneal stroma, but not its hardening, or a real change in form of it. Single layer epithelial, superficial, is reshaping by pushing on the inflammatory stroma, and this effect is taken for a biomechanical change... but it is a handy interpretation error (remember that the corneal topography specular measured the surface of the epithelium, and common thickness topography techniques do not separate the stroma of the epithelium and analyze the cornea as a "block"). Proponents of the CXL technique argue that biomechanical measuring instruments used in clinical routines to assess the stiffness of the cornea fail in vivo to measure the hardening that "must" necessarily exist after CXL, and that if they do not, it is because they do not work well. The problem is that these instruments work very well to account for the softening of the cornea (for example, these instruments are susceptible to the effect of refractive surgery corneal when it thinnes, even little, the corneal stroma). In your situation, I would realize a topographical control in a few months, and would of course continue no longer rubbing my eyes. If strictly observe you this, you see no progression of your Keratoconus, right, and the left eye will be also saved this affection. You can send me a copy of your maps to gatinel@gmail.com If you want a confirmation. I would like to contact you following your rethinks concerning the cross linking treatment which I find very interesting. I am 32 years old, I was diagnosed with a keratoconus in 2009 in Toulouse in Stage 1 more advanced on the left eye than on the right. After 6 months I went back to my ophthalmologist to do a follow-up review, to find out if my kératocone is evolving or not. Fortunately it was stationary stage and my ophthalmologist offered me glasses and unfortunately the glasses corrected me not the vision, but since I see very well with my right eye and that my kératocone in stationary stage I did not follow up. But in 2015 I noticed a drop of vision at the level of my left eye and I have a feeling of having something in my left eye and I see a little blurry. After I took the decision to go see another ophthalmologist since I currently live in Quebec. A friend referred me to go see Dr. X at the Montreal Glaucoma Institute and after the consultation the ophthalmologist offered me the treatment by cross linking without asking for my old topographies to make a comparison. This really worried me especially after reading on the Internet The opinions of people who have undergone this treatment of cross linking. According to you, should I use the crosslinking in the next few weeks months or rather tried the semi rigid lenses and according to you the made of stayed all day in front of a screen promotes the evolution of kératocone and degradation of vision? The evolution of the kératocone stops at what Age? Thank you doctor for your first answer. Following my first question I return to this site to know is what the fact of compress the eyes can advance the keratoconus because as I explained above that I was diagnosed with an advanced keratoconus and my parents do not want a lens ( For they say that its destroyed more beautiful and it makes dependent that all my life I will be condemned to put them) so I prescribed the glasses with high degree in addition even with these glasses I see not really well I can say 8/10 but at least I see better With glasses that without glasses so suddenly I am sometimes forced to compress the eyes: Make them very small to see better and its I do almost every day at any time it even became like a tic for me here is why I want to know if there is a Dange R a SA and if it is may be its the cause of the evolution of my keratoconus because in general I rarely rub my eyes. It is likely that any action resulting in a 'stress' or a repeated mechanical stress will eventually alter the biomechanical properties of the cornea and cause or accentuate a deformation as that known as "Keratoconus". The notion of ocular compression during the night (pillow, hand) also appears frequently associated with Keratoconus. It would be better to fit contact lenses, which support on the cornea is not dangerous and which is the best tool of Visual rehabilitation for Keratoconus (stop eye friction enough in my experience to stabilize the evolution). It is not legitimate to propose a CXL in the absence of certainty with respect to the evolution of Keratoconus. From my point of view (and especially that of the Cochrane study), the CXL did not demonstrate its effectiveness to the progression of Keratoconus. The likely effect of the CXL is limited to induce a scar remodelling of the ocular surface, which explains the low topographic changes, the absence of measurable solidification of the cornea, and the failure of the CXL procedures where the epithelium is not removed. In short, the best is to make sure that you do not rub the eyes daily, unconsciously, and also that you do not sleep by pressing on one eye or both eyes, the head in the pillow, or against the front arm, hand... If your corneas are more subjected to a mechanical stress (friction), it is roughly on that Keratoconus will evolve further. The port of lenses rigid or semi rigid, or hybrid, is the most effective way to correct the vision of people with Keratoconus. Now doctor have to I do saw that far I don't see quite well and even then because he comes to the writings and am forced to squeeze my eyes already has the base I have small eyes and knowing that my parents don't want me to put lenses. My 13-year-old daughter was screened three months ago from a bilateral keratoconus and a bilaterally sectoral cataract. Three months later, another visit to the ophthalmologist revealed an evolution in the left eye (-1 diopter). A cross linking is proposed in order to slow the evolution. The right eye will be monitored every three months. Do you think that cross-linking is good indication in the case of my daughter who is only 13 years old? Your optician is maybe not entirely competent to judge the scalability of your supposed Keratoconus, but you certainly want to talk to your eye doctor. To judge the scalability of a condition, it is necessary to compare the examnens in time. Moreover, the evovolutivite of a Keratoconus is usually low or zero after thirty. If your Keratoconus was very dynamic, Visual symptoms that he had Ocxxx_xxx_5163ionne would have appeared sooner, as soon as possible. The CXL has no interest in your situation (assuming it has a real effect on the stabilization of Keratoconus, what no study formally for reasons of low strength and lack of control group). My clinical experience strongly suggests that the eye rubbing are at the origin of the corneal deformation (Keratoconus is not my point of view a collagen disease or dystrophy, but the mechanical reaction to repeated mechanical stress: friction most often). Finally, the diagnosis of Keratoconus may be posed by excess before actually minor topographic abnormalities. The discovery of a Keratoconus in a child or adolescent must be monitored closely with reviews of corneal topography, and there is no urgency to the months to complete a cross linking, if we consider this technique as effective for slowing the progression of affection. From my point of view, I advocate in these situations to stop the eye rubbing, who are certainly the cause of Keratoconus, and are often associated with a marked atopic field (allergies). It is often difficult to get children the strict stop friction. The realization of the CXL causes an inflammatory reaction that makes these painful friction, and surgery patients often stop to vigorously rub the eyes. This aspect, at least, is beneficial... But it can be even more beneficial to not to rub your eyes spontaneously. The CXL has a rate of complications (haze, infection), and while many ophthalmologists have use this technique for patients with Keratoconus, I do not recommend it for reasons detailed in the relevant pages. Finally, given the variability for the examinations carried out on affected corneas of Keratoconus, a variation of 1 d of the keratometry is priori not significant to assert the existence of a progression (an article will be posted on the site very soon to support this). I am 26 years old and I have a kératocone evolutionary especially the right eye for 5 years and I put lentils regides. My ophthalmologist offers me to make a CXL especially with 460 microns of thickness of. I have seen 3 ophthalmologist that confirm that I have to make an emergency CXL but I am very worried. So what do you think Dc? Do I have to do this? The development of Keratoconus is at a pace that does not constitute the slightest 'emergency', if that term is understood in its medical sense. It is important to specify the pace and intensity of this evolution, as well as the current stage of Keratoconus that you present. I have noticed that the diagnosis of scalability is itself often questionable, because it is carried out according to topographic indices considered in isolation, and without reporting them to the variability of measures that is more important in patients with Keratoconus (the same values are not always obtained when the examination is repeated several times in the same subject). Moreover, it is very important to completely stop rubbing your eyes. In my experience, this condition is sufficient to stabilize Keratoconus, which I think is triggered and aggravated by vigorous and repeated eye rubbing. The CXL is not devoid of risks, and even once, the non biased study of literature (HAS, Cochrane Library) leads to the conlcusion that its stabilizing effect is not demonstrated. It is likely that stabilization induced by the CXL is not the result of a corneal hardening (which unfortunately does not happen in vivo) but arises rather from the fact that the eye has become very sensitive after the CXL, it is possible to rub it as before. The healing of the epithelium (which is removed for the technique of CXL) explains the changes of corneal topography (slight flattening, little significant clinically). If you think it is better to take the risk to do something useless to not make something useful, it is completely your right and I am only giving you my personal opinion of practitioner. I never prescribe for CXL, many patients of Keratoconus since ten years older. None of these patient was grafted, Keratoconus is perfectly stable at those who don't rub any more eyes, and barely living among those who do not stop to do, but do it less often and less vigorously. If you think you can not to rub your eyes you, worth the delay and topographic exam in 3 months, which will certainly show no significant change (if you stop the eye rubbing). The problem is that just after a year the kèratocone evolved and it forced me to change my lentils with a decrease in vision, but there was a great difficulty during the adaptation of lentil and the choice was not successful. Is that normal? Personally after reading your article I do not want to do the CXL especially with my job and contact with the computer. I made an appointment with a second ophthalmologist who confirms to me that at 47 years we do not practice CLX since the disease will have very little chance to evolve (C is D after him C is a frustrating keratoconus). He advises me to return in 6 months in order to make another topography of the cornea and by then I change glasses to see a little clearer. .. What do you think? I quite agree with this colleague. Propose a CXL 47 reaches of fruste Keratoconus patient has no meaning or interest (medical). It may be interesting to realize without emergency a corneal topography for your son, and explain that it is not good to rub their eyes, that adolescents often do by spending time on the screens (consoles, computers, etc.). From my point of view, Keratoconus is caused and exacerbated by the eye rubbing (often associated with night ocular compression extended in patients who sleep on the side or stomach with a support of the head in the pillow). This is not a genetic disease, even if of course genetic factors predispose certainly with certain characteristics for Keratoconus through atopic ground, a lesser thickness of corneas, etc. This is not proven and remains a hypothesis, but it is largely corroborree by clinical experience, and the fact that he has never identified genetic mutation affecting directly the quality of collagen corneal for Keratoconus (whereas mutations have been found for other corneal dystrophies). So, even if you have a form of corneal topographic irregularity currently called "fruste Keratoconus', your son is not necessarily carry a genetic anomaly, favouring the appearance of Keratoconus. Hello, I'm suffering from a bilateral Keratoconus discovered in 2007 (I'm 29) which is more advanced on the right or left. My view down my eye doctor asked me to do a CXL to the two eyes in March last year which in was made in April 2015 for both eyes. The surgeon also suggested the installation of intracorneen rings for the right eye, but to the amount of intervention I headed to another practitioner. The laying of the rings went very well with a flattening of the cornea. Today the latter always offers me a topolink for the right eye and want to redo a second CXL at the same time think you? From my point of view, the CXL is of no interest in this context. Also the risk of local inflammation would be greater in case of topoguidee + PKR CXL on a cornea have already experienced a CXL and intra corneal ring type surgery. I'm almost 29 years old and I have a bilateral keratoconus, in short in the last deal I did it's been two months my right eye had a 493 micron thickness; My OG with 466 mi; In short my eye doctor told me was a régide lens that I wore only for 3 days after I got it accedentalment xxx_xxx_5163se it really helped me especially side colors. He advised me to order absolutely eye friction seen before supposedly 9 months I had no or otherwise say I didn't notice this problem but when I went on a trip I contracted an alergie and I severely rubbed eyes for more than a week, and even after I kept rubbing them in order to improve the view until the day or he advised me d ' stop , also I note something weird. I do the strength training and just after completing my session my eyesight improved remarkably especially when I read the newspaper or even the pc, then after she gradient (talk about the left eye) course without the touch or nothing at all. – Can I sleep on my side without applying a mechanical constraint on my eyes? -Bodybuilding or physical exertion is it good or bad for the eye in my case? and one last very repeated question: at what age can say that evolution is stopped on by taking these precautions don't solicit eyes by any mechanical effort? You were certainly at the start of a little thinner than average corneas, and Keratoconus is from my point of view by the eye rubbing repeated: "no friction, no Keratoconus '! It is crucial to stop if you do not want as Keratoconus evolves. In my experience, patients who don't rub over all eyes present no increase of Keratoconus. Those who continue to do it, even a little, often present a development whose gravity is proportional to the intensity and frequency of the eye rubbing. Weight training is not contraindicated; The visual improvement felt is difficult to explain. It may be related to changes in intraocular pressure and/or variations in pupillary diameter, but this remains speculative. If you sleep on the side without pressing the eye, there is no additional injury to be dreaded. Operated in 2008 by LASIK for treatise a myopia, I have since 2010 experienced a strong regression of my view. I consulted several ophthalmologists, who following the topographic survey all found a bilateral ectasia. To this day, a hospital specialist offers me a CXL on the right eye whose ectasia evolves regularly since 2010 (more than the left eye). At the same time, I am in the process of adapting a spot lens by an optician who specializes in this practice and works in collaboration with hospitals. These lenses bring me a visual comfort that I dared not hope for a long time (glasses and soft lenses ineffective, classic rigid lenses too hard to tolerate...). After reading your article, I logically question the relevance of the CXL. Having already suffered a heavy setback after my refractive surgery which was to bring me visual comfort and which in the end caused a post-LASIK ectasia, my worries are I think legitimate. Do I take a risk (aggravation until the need for a transplant or other...) Not to do this CXL on a ectasia evolutionary, and what is it? More exactly what is the benefit-risk ratio according to your experiences?? In my humble opinion, the CXL is not a technique with a great interest in the primary (eye rubbing that caused the Keratoconus) ectasia or secondary, after Lasik. The reasons for skepticism are widely mentioned on this site, and supported by the meta-analysis from the Cochrane library recent. However, it is psychologically difficult to patients to do 'nothing', when some practitioners offer a method supposed to curb them the ectasia. In such situations, it is appropriate to repeat the topographic tests: If the ectasia is stable (which will be the case if you rub more priori eyes) so there is no interest in making a CXL. This sensible technique harden the cornea (but who fails to do so) provokes inflammatory and scarring of the cornea. Topographic changes induced by it are the consequences of this reaction, but the latter is dispensable in this context. I am perplexed because the OG has an AV of 3/10 and I see mainly with the OD! It is important to understand why the right eye Visual recovery is not good. There may be inflammation and scarring disorders caused by the CXL. Low vision is can be not linked to an evolution of the keroatocone, but a consequence of the cross linking. Furthermore, it is important that you don't rub you more eyes if you really want that Keratoconus evolves more. I am 42 years old and I made a lazik correction for my miopie two years ago. The intervention has done well and my vision has become perfect. But a month ago I felt a sudden drop of sight to the left eye. After consulting my doctor diagnosed a so-called weakening of the cornea from friction and stress. He indicated an emergency crosslinking. The crosslinking has summer done a week ago but I still have a blurred vision like fog on the treated eye and I am afraid that it will not disappear with time. Is that normal to have this after the intervention or not. And what it is necessary to do the same procedure for the right eye or it is not worth especially that I understood that it is necessary to froter more eyes. Visual blurring is related to the presence of inflammation and healing post CXL. If you do really more rub the eyes there is no risk of ectasia. If this risk exists of potential way, the CXL is not able to reduce it in reality. On the other hand, the risk of complications (haze, infection) of the CXL should urge caution. The cross linking is certainly not to perform in an emergency. The first thing to do is to strictly stop rubbing your eyes, that you probably do if you have Keratoconus (allergies, work on screen, eyestrain, etc. are often found causes). Sometimes, the eye rubbing will be held in the morning or after sunset, make-up removal, etc. If you do more rub the eye, Keratoconus will cease to evolve. Moreover, wear rigid lenses is the best solution to correct the vision, but the adaptation of these lenses is difficult when the Keratoconus is evolved. We must strive to find a lens adapted, or try a glass scleral (large lens that is often better tolerated) adaptation. You actually present a very rare LASIK complication, except if the cornea is originally thin and that one rubs his eyes, called corneal ectasia. The ectasia resembles Keratoconus: it is a Biomechanics decompensation of the cornea. From my point of view, Keratoconus is not a hereditary disease of type 'corneal dystrophy', but the direct result of eye rubbing repeated. Without friction or trauma repeated the cornea of this type, it is from my point of view very unlikely or impossible the cornea can deform itself and give a picture of Keratoconus (while no specific mechanism that could explain this type of deformation has been highlighted, that no gene for Keratoconus has been identified, etc.). In short, I consider that Keratoconus is a mechanical condition, a bit like the ankle sprain, although the mechanisms and involved fabrics are different of course. If you rubbed your eyes before LASIK, you probably weakened your corneas, without them being weakened biomechanically to the point of evolving towards a topographic chart corresponding to what is called a keratoconus. But the realization of LASIK has accentuated this fragility (realization of a flap and thinning with the excimer laser), and the continuation of friction leads on this particular terrain to the pairing of the Ectasia on the left. If you read the pages dedicated to him on this site, you will understand why I disapprove of the corneal realization of cross linking, even in case of ectasia. This indication is from a good intention, that of 'stop' the ectasia, which has never been formally demonstrated, in the absence of a control group. The recommendation and the desire to perform a CXL is understandable however, because we generally prefer to try something rather than stay without treatment. It is almost certain that a freshly operated patient of CXL for ectasia stops rubbing his eye in postoperative (heightened sensitivity of the cornea, sensation that the eye is fragile because operated), and that this is enough to explain the stabilization. Moreover, once the cornea is "distorted" by the ectasia, there is unfortunately no chance that this surgery "reforms" the cornea. The small topographic changes observed after CXL are either "in the background noise of the measurements" or linked to the simple scarring and remodeling of the corneal epithelium (which is removed during the CXL, and then regrows, often in a More "thick", hence the slight flattening noted after CXL, which is therefore only a simple effect of epithelial resurfacing. In addition, CXL after LASIK exposes to certain complications not specific to this situation (infection), but also more prone to occur as the haze (marked inflammatory scarring of the cornea with reduced transparency of it). In your case, it does not seem necessary to realize a CXL of the right eye but as you have understood, to stop rubbing this eye. Also avoid sleeping on the side or on the belly by pressing the head in the pillow, in my experience, this habit also seems to lead to the appearance of phenomena of type "asymmetric distortion" of the cornea that resemble what is observed In what is referred to as "beginner keratoconus". You can conduct regular topographic examinations to monitor the evolution of your ectasia. If you are reading this page is devoted to the CXL and Keratoconus explanations, you will see that from my point of view, the key to avoid misleading or even advance the Keratoconus is of not not or stop rubbing your eyes. It is difficult to quantify reliably the evolution of Keratoconus, and the CXL is probably no more effective to stabilize to not rub their eyes. Sometimes scarring after the CXl is particularly inflammatory, and this can lead to a feeling of low vision, which is not much to do with the evolution of Keratoconus (deformation of the corneal wall), but more with a problem of ocular surface (epithelial resurfacing, inflammation of the superficial stroma in contact with the epithelium, etc.). I recommend you don't rub your eyes and realize of control topographies, which should then show the absence of worsening of the deformation of the cornea. My right eye goes to stage 4 very evolved, and the left eye to stage 3. Doctors blamed my ophthalmologist for not having made Crossliking in time for the right eye and for not having prescribed a rigid lens also for the left eye. Dear Doctor, It is disturbing I do not know what to do, should I do the lacrosse as soon as possible for my left eye in order to stop the rvolution. Find it me hard to blame your ophthalmologist because on the one hand, if you read the pages of the site dedicated to the CXL, you will see that I think that this method is not a panacea, and on the other hand, your Keratoconus remained stable between 2012 and 2015 without CXL. At the risk of repeating the same recommendations, the key when you get the diagnosis of Keratoconus is to immediately stop rubbing your eyes. If your Keratoconus evolves, it is likely that without your knowledge, you continue to rub your eyes vigorously from time to time, can be on a daily basis. Indeed, from my point of view, Keratoconus is caused by the eye rubbing, often carried out with the phalanges of the fingers. Unfortunately, if stop friction allows to stabilize the corneal distortion, there is no spontaneous expect improvement and the choice between rigid lens and transplant depends on evolution of deformation. The classification of Keratoconus in stages (1 to 4) is a bit outdated, and if you want to send me your maps, you can write me at the address gatinel@gmail.com. Thank you dear Doctor, I can send you by email to the address indicated the last Pantacame 2016. But Doc, my Opthalmo also explained to me that the cause is also hereditary, on the side of my father (46 years) who presents a keratoconus from his early age and to the present day. My sister (22 years old) has also had a non-keratoconus since 2011. As a dear question Doc, should I hope that the cross can stop the left eye knowing that currently with the rigid lens, the view is 9/10. I am 30 years old, I live in Brussels and I was diagnosed with a kératocone at the age of 25 (2010), after consultation I was prescribed rigid lenses that I could not tolerate and that fell in my eye. But my ophthalmologist didn't want to hear anything and just asked me to go home with no solution for me. The state of my kératocone not being too advanced, I no longer wore lenses and I stayed like this for 4 years, I could drive, work on screen without problem. In 2015, I really felt that my eyesight was diminishing (especially at the wheel) and with my right I was unable to read. So I once again consulted another doctor. He da'bord wanted to check that my kératocone was still evolving from January 2015 to July 2015 he didn't do anything and when he was sure there was still evolution, he made a cross-linking to the right eye (or I would see 1/10). Then in December 2015, we made a cross linking combined with a PKR correction to the left eye. When I arrived cjhez him in January 2015 my view with the left eye was 7/10 and with glasses (10/10) before the operation of the left eye I was only 5/10. And today my astigmatism has the left eye increased I am at 4/10 but with a bcp correction stronger than before the operation. I currently wear mini scleral lenses (which I fill with phsysiologique serum), since March 2015 at first my ÉTAITV view of 10/10 to 2 eyes with these lenses. But today I face lipids and proteins on it that make the view blurry and fuzzy. Not to mention the fact that I suffer to put them, almost 2 years later, I always put so much time to put them in the morning (almost 1h30) and I often hurt mostly to the left eye, I can not even open it after putting the lens. As soon as I blink my eyes the lenses are no longer clear. The week firm hold I go back to the contactologue who will offer me other scleral lenses (another material) but I would like to know if there is a solution for me? And especially why cross linking and PRK did not improve my view the PRK was supposed to allow me to be more focntionnelle without lenses (for all the times I have too hard to put them). I don't know if I can still trust my doctor. He has no explanation. If you read the pages devoted to the Keratoconus on this site, you will learn that I consider Keratoconus as connected with the realization of repeated eye rubbing. These frictions arise because the eyes itch, and are therefore more common in people with allergies, people working in dusty environment or even those doing many hours of work on screen. The progression of Keratoconus on the right side is probably explained by the friction that you have not stopped (evening because you have not been informed of the risk, either because you could not prevent you to do so). Also I am very skeptical about the interest of the CXL for reasons which are set out on the pages of this site. My opinion is unfortunately little shared by most of my colleagues, who easily realize the cross linking, sometimes as soon as the discovery of Keratoconus. from my point of view, this technique has as one positive effect to reduce the temptation to rub the eye (because this often becomes very sensitive to the immediate course of the CXL). The paradox of the CXL is a very invasive technique, which is to provide to the corneal tissue of the electrons to form of hypothetical Covalent bonds between the collagen fibers. From my point of view, it is better not to break these lesions in not rubbing the eyes, and not to resort to the CXL. For your left eye, which was to be significantly less reached, your ophthalmologist found it useful to combine PKR and CXL. From my point of view again, the CXL is useless, and many scientific publications attest that the only PKR is unable to evolve a beginner Keratoconus. The risk is the association of the CXL and the PKR complicated scarring of the cornea, and for example cause a haze (a superficial clouding of the cornea). Of course, if you continued to rub the eyes, whose left eye, you can be also contributed to cause the evolution of corneal distortion. It is difficult to say for what reason (s) your acuity is low on the left side, but your surgeon should be able to provide you with more specific and detailed elements. I insist to conclude on the CXL is a technique that is being a consensus in the medical community and that my point of view is personal, even if it is the result of logic and data published on this techniques, as well as observation of many case, and above all, a recent report from the Cochrane Library which concludes unable to conclude precisely in the interest of the CXL both studies are low strength or biased. It is also certain that patients with Keratoconus are very demanding of 'something' to stop the evolution of the malaidie. However, that something exists and costs nothing: just don't rub their eyes. I am addressing you in desperation. I am 44 years old and I was operated for Lasik in Montreal in 2002. All went well and I had a very good vision for years. In 2008, I lived in Paris and I noticed that my vision was sometimes a little confused, but it depended on for days. I went to an exam and I was about-0.25 of astigmatism in the 2 eyes, so nothing to be alarmed about. Some mornings I saw very well, others not. My view has continued to deteriorate slightly but nothing to really disabling until this year. So I ended up going to see an optometrist for me to adjust a pair of glasses. Unfortunately, she was unable to find the good correction and the topography of the cornea results were indicators of a corneal ectasia. So she sent me check a corneologue at the Institute or I had my lasik, which confirmed the diagnosis. He wants me to do the cross linking immediately (I have-2.00 of astigmatism in eyes 2). I have doubts about this surgery (CXL) and reading this article only reinforces these doubts... I find that the clinic pushes me too much to do cross-linking and I wonder if it is not to hide the fact that they should never have done lasik in the first place. I do not particularly rub my eyes but I slept for years with a fairly heavy pillow on the eyes. Last winter, I cried a lot (personal issues) and applied ice to reduce the swelling on my eyes. This corresponds to the period or my eyesight has deteriorated really more. At 44, would not be prudent to keep track of the evolution of my ectasia before taking such drastic action? According to my reading of my account (I had a lot of trouble to get), I wish 428 microns for the left eye and 445 to the eye right microns. Currently, I wear daily soft lenses and I see very well. I don't know where to turn for a reliable opinion because I feel that everyone is trying to protect themselves at the expense of the health of my eyes. If I do not have cross-linking and keep my cornea to thin, what are my options? Thank you so much for taking the time to read me. I am extremely anxious since I received this diagnosis and the lack of information on the subject of increased stress. (If want you, I can send you my complete file). If your astigmatism is "only" 2 diopters in each eye, the ectasia is for now 'moderate', at least functionally. There is no urgency to make a CXL for a condition that seems to appear very gradually, and looks after repeated mechanical stress (weight of the pillows, then ice, and certainly regular friction you don't can be not realized completely but that accompany episodes of eye irritation). In my experience, the late ectasies after LASIK occur in patients whose corneas were initially somewhat "weakened" by the friction in the past, but no more (when the corneas are frankly impaired in biomechanical terms, the post LASIK ectasia occurs quickly, in a few weeks or even a few days). I advise you to not at all support on the eyes (pillow, nor ice, nor of course the hands), and perform topographies of control, with differential cards that should reveal a stabilization of affection, if still once you make sure not to rub. Corneas will not return to a more regular form, but in principle will remain stable. You can send your file (topographic maps of 2002, recent, and reports operational including the equipment used and the depth of the correction excimer ablation) to gatinel@gmail.com I hope that these details you will have a little reassured. All ' SLA I wanted to thank you for your answer as of 08/01/2016 at 16:14. I left you a question under the name Mima Rach. I had an early August concern with my left eye, I got hurt by putting the scleral lenses and I touched the cornea. My eye was all red and I couldn't open it. So I went to my doctor, he had to put me anésthésiantes drops and he scraped with a needle then he put a dressing lens as after the CXL. After your help I asked him if I had a HAZE in my left eye, he was quite surprised that I asked this question and he told me that when he was operating he was putting drops and special products to avoid this. I went back to see him yesterday for a check and there he tells me that the HAZE to the left eye is still very present that I must continue to put corizones drops and that O, n will see each other at the end of November. The only solution would be to eventually re-operate a PKR but that only time would be our ally for the disappearance of the HAZE. I do not know if I have to believe to be honest, I have a meeting on Thursday with another doctor (not specialized in the Kératcône) because in Brussels my doctors ETS reputed to be the specialist of the keratoconus because I do not know if I have to believe. Before doing the operation CXL and PKR we had discussed and he had said at the worst it will remain the same at best you will see better. He never at all ever mentioned the risk I see less well and now I asked him and if after this 3rd operation my eyesight still deteriorates, he replies to me it does not risk. I saw 7/10 with my left eye before and now I'm at 4/10 with more astigmatism. I do not know what to do doctor, please guide me what do I do, I would just find the little independence I had before these operations, ie I could at least read and watch TV without lenses. The scleral lenses tire me, I will still change them as they are always dirty, I have to constantly rub them with a cotton-rod because liupides form and the view is not sharp but I have no choice but to wear them because without I don't know how to work or drive or read. Without talking to you that in 2 years almost I still have not managed to find the right method to put them, this is not obvious APS with physiological serum etc.. What do I do a 2nd operation to the left eye to enelver the haze or is there a real chance that this disparraisse haze with time? It's been more than nine months since I was operated on the left eye. A huge thank you in advance for your help. It is difficult to give you a clear conduct in this context. The haze is a complication of the CXL, in my experience it subsides with time, but it can take several months. It seems wiser to not proceeding at the moment, and the adaptation of the scierales lenses remains the best option. I take this response to inform potential candidates to cross linking that this technique should in my view no longer be performed. I am many patients which the progression of the KC is zero as soon as they stop rubbing your eyes. Hello I got a liking cross has the left eye that made 17 days but I see still blurry. It will take how long? Healing after CXL can be long, because of the inflammation generated by this technique. The removal of the epithelium "lays bare" the superficial stroma (the middle layer of the cornea, under the epithelium), which is often more irregular (epithelium remodels part of the underlying deformation). After CXL, the epithelium regrow and resurface the denuded corneal stroma. Sometimes, the resurfacing improves the surface regularity, hence the only positive effect of the CXL. From my point of view, this technique, which fails to stiffen the cornea in keratoconus patients, is useless, except that it gives the impression to the patient we can "do something". The practitioner can feel comfortable a surgical act whose outcomes are not necessarily very important on an already damaged cornea. The most important, and more effective than the CXL is to stop the eye rubbing. I consulted an ophthalmologist in 2012 and he told me that I have a kératocone and he offered me to wear rigid lenses, lately I consulted another doctor who told me that it is necessary to do a cross linking to stop the progression of the kératocone (and carry The lenses after the operation), I want to know is what cross linking will stop the progression? and is there any problems of wearing rigid lenses after the operation? To not have Keratoconus, or stop the progression once installed, the remedy is simple: do not (no longer) vigorously rub their eyes. The cross linking not meant nothing if you observe this simple precept. It is heartbreaking to see the CXL proposed during a consultation for Keratoconus, without monitoring to ensure at least a progression (which is directly related to continued the ocular trauma related to friction). Patients with KC are very demanding of therapeutic solutions, and the CXL is timely to meet this expectation, in addition to providing a windfall to some Labs and practitioners. I based my offers on successful experience: none of the patients reached of KC, I am regularly to the Rothschild Foundation, is progressing when friction are stopped. My medical responsibility is that if this was not the case, I will not take the bet to CXL, and explain to patients that the friction they exercise (sometimes without really being aware) are the cause of Keratoconus and its progression. The CXL fails to harden the cornea in vivo, which is his only goal at the beginning... but it never stopped to consider this treatment failure as likely to jeopardize the interest of the technique (sub of enough false pretences of instrumental failure, instruments that do not increase the rigidity of the cornea after CXL are considered failing!). As the CXL provokes inflammatory and scar, which provides a modest flattening of the cornea, and even once, because it is psychologically desired by patients to 'do something', cards are a little blurred, and it is arranged for a look that is favorable and biased on this yet quite invasive technique. So I recommend you do not do the CXL, and perform corneal topographies at regular intervals, you will observe that in the absence of friction, your condition will evolve further. What is your opinion regarding the installation of intra-corneal rings on advanced stage keratoconus? Recall first that the rings do not heal Keratoconus. They are somewhat similar to 'tutors', allowing the plants to grow vertically. When we take them off, the initial deformation reappears completely. being the results are random and uncertain on the evolved forms. The uncorrected vision may not be very improved though occaseionne Keratoconus important myopia (the expected astigmatism reduction made by the Rings ' will be' not really). Typically, patients followed for Keratoconus are usually offered 1) a cross linking) 2 rings and 3) a transplant when the previous methods have failed. Most of the time, when we analyze retrospectively the records, we realize that the indication of the rings was a little unreasonable, in the sense where despite the laying of the rings, a glasses or contact lens wearing was possible to correct vision. Adaptation of a lens is more difficult after placement of rings, because these locally create a distortion of the corneal curvature (averaging periphery). The interest of the rings lies rather in new forms, with a low myopia (for example, when the patient's refraction is close to a simple myopic astigmatism). Their result is often variable, because the instructions that lead to choose the placement of the ring are a little empirical (and corneas do not all react in the same way). If you browsed the pages devoted to the Keratoconus on this site, you will realize that from my point of view "mechanics", where the Keratoconus is induced by the eye rubbing, the best guarantee to stop the progression of the disease is to stop friction. This is enough to logically stem deformation. For Visual rehabilitation, rigid lenses offer the best solution for optical efficiency. I never prescribe CXL for the widely documented reasons on this site, and the rings affect only a minority of indications. The wisest again is to stop chafing, which is not always easy, and turn to the contactology. Hello doctor, thank you for your reply. I would also like to ask you if the appearance of visual aberrations is related to the evolution of the keratoconus and whether it is possible to attenuate them with wearing glasses or to treat them otherwise? Rigid lenses are the best means of correction to reduce the visual aberrations of the keratoconus. Eyeglasses can only correct myopia and astigmatism caused by corneal deformation, but these optical flaws are not the only ones that disturb the vision of patients with keratoconus. The result of techniques like corneal rings is quite random. They can sometimes simplify eyeglass correction by reducing part of astigmatism. In some stable forms (which are those where patients permanently cease eye rubbing), it is possible to perform a surface laser treatment (PKR) to regularize the corneal profile and to correct some of the induced irregularity. In this context, it is perfectly useless to add a laser CXL (unless you inflate the invoice), because the latter risk to induce inflammation of the corneal stroma, is toxic to the kératocytaires cells, and has no documented clinical effect on the rigidity corneal as explained on this page. Thank you for taking the time to write this article against the current. I find myself very well in what you describe. After 6-7 ophthalmological consultations, I was detected this famous keratoconus. At the outset, I was offered to realize this CXL. I have chronic urticaria and I have a strong propensity to rub me (sharply eyes). In short, if I follow you, I can only blame myself (more acceptable than the law of the generic) and above all, if I stop, I should stop the damage. Finally, I understand that the rigid lenses seem to be a good solution. Can a patient suggest a preference? Can I decently display a preference for lenses and refuse the CXL? I have 3/10 to the left eye and 7/10 to the right eye, I can quite pass me correction for now. Not only is it your full right to refuse to perform a cxl, ... and this is even from my strongly encouraged viewpoint. The CXL is a technique whose efficacy is not demonstrated when a sufficiently critical reading of the publications is made (this reading tends to strongly suggest that this technique is ineffective,) or at least not greater than a "placebo" – there is no control group in the study conducted anyway. Industrialists and practitioners have an interest in doing this technique, and it must also be admitted that patients are often applicants because they fear that the disease will progress if not, and "that something must be done well". Keratoconus is not an evolutionary dystrophy but a simple deformation following repeated rubbing. This is my opinion of course, but it is supported by repeated observations, logical arguments, and above all, which will certainly interest you, by the fact that patients who permanently stop rubbing their eyes never progress. It's not your fault that you rubbed your eyes, for this is a natural reflex mechanism, and there is an underinformation and a lack of knowledge of the role of eye rubbing in the genesis of friction-induced corneal deformation, known as "Keratoconus". Contact lenses are the best way to restore a good vision. Maybe cross linking smooths the cornea and decreases that impact? This is all the more problematic as I no longer support the rigid lenses with this eye. Indeed, if the CXL relieves a little eye itching, this may be a beneficial aspect of this technique. But it's ' expensive paid ' to no longer rub your eyes! Irradiation by 30 MN of ultraviolet radiation, corneal deepithelialization and stromal impregnation of vitamin B2 (riboflavin) are quite aggressive techniques for the corneal stroma (toxic effect with loss of kératocytaire cells extended several months, risk of haze, etc.). A simple deepithelialization and possibly some excimer laser impacts may suffice to produce the same effects on corneal sensitivity, and an equivalent relissange, at lower risk. It may be wiser to moisturize the corneas, finding the most suitable eye drops (source of the greatest wettability in your case). I am 53 years old and have been wearing lentils for 20 years my keratoconus having been found in my thirties. I do not observe a diminution of my vision, except for close but is not it rather the age.? From the Fifties, is a keratoconus evolves? What do I do? Crosslinking or not? I think this indication of cross linking (CXL) is absolutely unfounded! As you will have understood if you read the pages devoted to the CXL, it is already not entirely established that the CXL is a very valid indication in any situation since the results are unconvincing, with regard to at least the primary issue of CXL which is to harden the cornea (which no study can prove in clinical). A stabilization of the condition has been reported after CXL, but there is no control group in the studies in question, and in our experience, the cessation of the eye rubbing guarantees in all case the cessation of the progression of the keratoconus. In the Fifties, unless you rub your eyes like a crazy, there is little risk that the disease will progress, the cornea's deformation state has long since reached its "equilibrium". There is really no interest (medical and for you I hear ...) to perform from CXL. I allow myself to expose my case, and my doubts, since my visit to one of your colleagues who offered me the CXL fairly promptly. I am 34 years old, I was diagnosed with a keratoconus about 22 years old in both eyes (right eye more affected). Moreover, at random from personal research, I think, with a fairly good confidence, to be diagnosed with BPES syndrome (as well as several members of my family), even if no medical confirmation has been made. 10 years ago, I tried the rigid lenses but I did not support them (maybe due to the BPES?) at the same time, touching my eyes is not really my cup of tea ...), and I ended up falling on one of your colleagues, who not only told me that the lenses Rigid were not necessary at this time for my case, but who in addition has for several years managed to obtain me a correction more than satisfactory for both eyes simply with glasses. Unfortunately for me, the latter left two years ago in retirement, and his replacement told me last month that she "could not do anything for me" (very reassuring speech when one is a patient!) and redirected me to a surgeon. It is this latter, which, after very quickly explained to me that with a correction glasses it could reach 10/10 OG and 7/10 OD, proposed to me a large operative program containing the laying of corneal rings, followed potentially by a laser smoothing To correct the correction, then a CXL to freeze the whole. I confess that, having never undergone an operation, I have not been reassured. While waiting for his quote, I wanted to know more about these operations, and I came across your articles. To go further, I wanted to learn a little more about the CXL and its real effects. I found some reports (evaluation report on the CXL of the HAS June 2015, Cochrane CD010621, IQWiG 15-05) which mention at best a "suspicion" of profit but above all a low level of evidence, and a lack of longer-term setback as to the real benefit of the technique. And despite the favorable opinion of the has on the CXL and AIC in 2015, if I understood correctly, they are still not actually taken care of by social security at the moment, at least the surgeon I saw meant it to me as well. In addition, I have also read several times that the CXL should only be offered after two Tests spaced out for 6 months giving signs of evolution. I am therefore surprised by the direct proposal of the operation, which adds a stone to my wall of doubts. Regarding the corneal rings part, the surgeon clearly told me that he could not tell me what final benefit this correction will bring me. I am questioning the interest of the AIC, and I am convinced that a correct eyeglass correction could be enough for me! Waiting to learn more, I try to apply your precept not to rub your eyes. It's easier on paper, the gesture is sometimes totally unconscious! Looking back, this spring was particularly irritating to my eyes (pollen? pollution?) and actually I felt a drop in view in the early summer. I try to use eye drops instead when the urge to rub is felt. After reading your various previous answers, I think in my case you would advise me of the operation. Would you have a colleague on the Strasbourg area to advise me who would share your skepticism rather than send me directly to the scalpel? I have a consultation with one of your colleagues at the new Civil hospital in February to have an additional opinion, I would not hesitate to refer to your conclusions if he evokes the crosslinking, because, as you mention in your articles, even if I am Like everyone in search of a "solution", I like to keep a critical mind as you do! Thank you for that. Thank you for your testimony that certainly joins the experience experienced by many patients in your situation. The fact of presenting with a keratoconus often triggers a cascade of intervention proposals, which usually combine the laying of rings in the cornea, a cross linking, and why not the laser then. Be aware that this interventionist attitude is a relatively recent "mode" (about ten years). Unfortunately, not all patients show a sense of curiosity and criticism (and it is quite normal to trust a practitioner). The craze for the practice of these acts, which are both remunerative and desired by most of the patients who feel of course "taking charge", is however not commensurate with the results obtained. And even if we believe in the effects of CXL, this technique should only be proposed after having documented a progression by carrying out two exams a few months apart. There are many patients with whom this technique is proposed first. Some confreres, who practised the CXL, confessed to me half-words that they preferred to realise the technique from the outset, rather than letting a patient who could, following a second opinion visit, be operated by another practitioner ... Fortunately, the arguments I have been making over the past few years are beginning to wear, and are sometimes relayed by some more scrupulous confreres. Doubt as to the merits of the CXL is also present in an increasing proportion of spirits, because if it is legitimate to seek to "harden" a fragile fabric, the absence of "in vivo" results in the minds. In your case, it is important to no longer rub, and attempt an adaptation into rigid contact lenses, which is the most effective method for the correction of optical defects generated by keratoconus. The laying of rings can, in some very special case, cause some profit, but this one is often lean (I speak of visual benefit;)) and it is sometimes more difficult to wear lenses after laying rings. The rings do not provide glasses equipment in many case. And as your surgeon has confessed to you, the effects of the rings are quite unpredictable (the deformation they induce usually goes in the "opposite direction" of that of the keratoconus, but it remains rather empirical and unreliable enough, without being totally devoid of Complications). Finally, a background treatment of your allergy (desensitization, local treatment). I am a young aged 29, I wear glasses for a year, my vision becomes more blurry especially OD, I took an appointment with the ophthalmologist, he told me that there is suspicion Kératocone. Please advise me doctor what should I do? Is it possible that a worsening of the kératocone seen by the measures are the result of superficial epithelial reshuffles and therefore subject to improvement? The removal of the epithelium during the CXL procedure stripped the Bowman layer (the most superficial part of the stroma). The deformation appears more pronounced because the epithelium is a layer of pluristratifiée cells that reshapes to resmoothe and reduce the underlying irregularity. This explains the frequently observed worsening after CXL: The keratometry is higher, the time that the epithelial regrowth does its work (and sometimes slightly better than before the CXL, which explains the modest kératométriques gains measured on average at Far away from this procedure. If the keratoconus is proven, it is essential to no longer rub your eyes, and possibly change your sleep position (it is likely that you sleep on the belly or on the side, with the head rather leaning on the right side). If you are allergic, you have to carry out a balance sheet, a possible desensitization, etc. Make a check one month after stopping the friction and you will find that the keratoconus does not evolve. There is no need to make a CXL in our experience; The only interest of this technique (for the patient) is that after its realization, the eye rubbing are less frequent (patients no longer like to rub their eyes as they are operated). If you can no longer rub your eyes, the stabilization will occur spontaneously. For the correction, the rigid lenses are the most effective. Does a worsening of the kératocone on the stroma be felt by pain? Keratoconus is a non-painful pathology (eyes can be irritated, but not painless to speak), except in case of complications observed at very advanced stages such as Hydrops. I am still not convinced by this thesis of eye rubbing and probably would not be seen that I continue to see in my consultation of the forms hereditary of keratoconus... unless the mania of friction is genetic/??? All studies agree on a percentage of family forms less than 15/20%. This means, on the contrary, that 80% of case are sporadic. It is fortunate that diseases that affect several members of the same family are not necessarily 100% of genetic origin. On the other hand, it was shown that the corneal thickness was a highly inherited trait. Thus, subjects whose corneas are familially finer, living in a conducive environment (dry air, polluted, allergens) or exercising an equivalent activity (prolonged work on screen with eye fatigue) can actually adopt the same Habits (excessive eye rubbing). Numerous studies in homozygous twins have shown that there is often a discrepancy (one twin being reached, the other not). This is a little annoying to attribute a genetic origin to the KC. On the other hand, there is a genetic dimension in this condition; Thinner corneas on one side, and immune dysfunction on the other (allergies, atopic, etc.). In the unilateral or very asymmetric forms of KC, the eye reached is the one that is rubbed, and, this is new, the one against which the patients sleep! – > https://defeatkeratoconus.com/home/eye-rubbing-sleeping-position-and-keratoconus/ The correlation between preferential friction and sleep position is much higher than the presence of a heredity (which, repeat, is absent in more than 80% of the case). Hello, I own a keratoconus with two eyes with a correction with glasses at 12/10 OG and about 10/10 OD. I can move without a bezel. I have already carried out a CXL to the right eye and stop any friction, since the operation: no evolution. I have been inquiring about the association of CXL and PKR for some reason in the hope of suppressing my astigmatism and why not recover some tenth of visual acuity. The PKR limited to 50 microns of ablation would allow it to achieve interesting results. It is possible to consider a correction by PKR in certain case of stabilized keratoconus (strict stop of friction), when the thickness of the residual cornea is sufficient, etc. A detailed review should help confirm this possibility in your particular case. Cross linking does not aim to improve the vision of patients with keratoconus, but to stabilize the evolution of the disease. If you read this site, you know that there is no need to CXL to curb the evolution of the KC: Stop rubbing his eyes is enough. That said, CXL patients usually tend to stop rubbing the eye, due to the inflammation and pain initially felt. In the longer term, the loss of corneal sensitivity induced by CXL also helps to stop friction. But if this stop is obtained spontaneously, then there is no point in performing the CXL. The latter is intended to harden the cornea (but this hardening, even if it happened, would not be able to withstand the energy delivered by the repeated eye rubbing). During CXL, a superficial layer (the epithelium, which then heals in a few days) is removed, and the cornea is irradiated with UV after impregnation with Riboflavin. This creates a physicochemical reaction that induces an inflammatory reaction of the corneal tissue. In general, after this type of aggression, the cornea tends to heal in "flattening" modestly, and it is this non-specific and indirect effect that is in fact sought. In some case, CXL induces or unmasks certain irregularities, which the epithelium is no longer able to resmooth. Finally, in some case, the inflammatory reaction is particularly intense, and there is a reduction in the transparency of the cornea (Haze post CXL). Follow-up and sometimes instillate anti-inflammatory eye drops. Again, the most important thing is that your son stops rubbing his eyes definitively. This will be sufficient to stabilize the keratoconus and be less costly and potentially iatrogenic than a CXL procedure. Thank you for your reply Mister Ganeshan This has helped me better understand and reassure me Cdlt B F.
Hello, I read your opinion on the operation Crosslinking and I wish to have your opinion on my case. I had a laser operation in 2008 at the age of 20 years and I was happy until 2 years ago or I started rub my eyes often and then a month ago my new ophthalmologist me to see a keratoconus evolutionary of both eyes. The right more reached than the left. It strongly recommends me a crosslinking operation and tells me that these are the only solution because I already by pass perform an operation and that my eyes according to him are only 3/10. It gives me a date of operation for the 30th of April and I postpone it for May 14th because I am not on the utility of the operation and even less since I read your opinion. When I talk about your opinion on the crosselinking he told me that for a person who never performed laser operation by passing it you were not in agreement but for people who already perform a laser operation and whose keratoconus is Evolutionary you all agreed that operation CXL is very important. Can you inform me because when I see the opinion of my ophthalmologist, yours is those internet comments I have a big doubt. Thank you for your response. I would like to have information about the keratoconus and the Operation Crosslinking. I underwent a laser operation in 2008 at the age of 20 years, today at 30 years I am informed that I have a keratoconus of the eyes the right is more attained. The ophthalmologist of which I am going to consult for the first time a month and a half informed me that I urgently had to undergo a CXL intervention because my keratoconus is evolutionary and that the CXL would allow me to stabilize the evolution. On the other hand when I spoke to him about your opinion that I found by chance on the internet he told me that the opinions was share for a normal CXL may that following my previous operation Maser mine made all the ophthalmologist agree and that the CXL imposed itself. I wish to have your opinion on the subject because my operation is scheduled on May 14th but I am really not sure I want to do it and will strongly need a notice other than that of my ophthalmologist. Then the corneal deformation will no longer progress: and in this case, the CXL has no interest (for you). To ensure the absence of progression, topographic maps (e.g., first month, then every 3 months at the beginning) must be performed and differential maps. In the absence of added trauma, the cornea no longer has any reason to deform further. In my experience, stopping friction is enough to stabilize an array of ectasia (not of the particular "keratoconus" observed after refractive surgery and excessive ocular frottemetns). CXL is not without complications; Its effect is not to harden the cornea (this does not work in vivo) but to induce an inflammatory and scarring reaction that can lead to modest flattening, and above all dissuades the patient from continuing to rub (pain, etc.). You can make an autobalance in this sense, be careful not to press the eyes when you sleep, and above all, again, no more rubbing. Contact Topographies performed at regular intervals (every month and every three months) should confirm the absence of disease progression. I was recommended by my ophthalmologist after analysis that I have to undergo a CROSSLINKING. So he also told me not to rub my eyes anymore. So he told me that I also have to wear rigid lenses but this is unbearable to my mind and so I would like to wear glasses! But after reading this page and all these comments I really wonder if it is necessary that I do this operation. and view the risks I'm pretty worried because this operation is really a risk. A logical attitude is to follow the evolution of your keratoconus by performing contact topographies at regular intervals. If you stop rubbing your eyes, the pathology will not progress, and this renders the indication of CXL (patients who rub their eyes after CXL continue to evolve). There is never an emergency to do the surgery. I had my right eye operated two and a half weeks ago. I was made a crosslinking: I am very worried because my vision is really blurry. I know that I did not see PS well before the intervention but not at this point. I'm in total panic. In 2015 I got the left eye surgery all going well. And the I don't understand. My next visit to the ophthalmologist is at the end of seven. My daughter is 15 years old and has a severe keratocône to the right eye and less strict to the left eye. The keratoconus seems to evolve when it did not progress at the beginning of the year. We are advised the CXL for the right eye since its cornea still has the right thickness. What do you think? The right eye has been tested positively with semi-sclerales and rigid lenses. In our experience, the progression of the keratoconus is under the direct influence of the pursuit of the eye rubbing. It is crucial that these are definitively outlawed. If the right eye is more reached than the left eye, it is that it was more rubbed than the left. There is a significant correlation between the most advanced side and the sleep position. In your daughter's case, check that her sleep position is not responsible for prolonged compression of the right eye, whether she sleeps on the right side, or on the belly with the head is in support of the right side (right orbit at Contact of the mattress or pillow). If it is the case, try to change this position, or protect the right eye with an eye shell to be secured with Micropore before sleeping. Patients who sleep in this type of position tend to rub their eyes during the night, and/or in the morning when waking up (irritation caused by heat, confinement, contamination by irritants or bedding mites, etc.). These measures are sufficient to halt the progression of corneal deformation. The CXL aims to harden the cornea. In clinical practice, this hardening is immeasurable. On the other hand, it is unlikely that it will have any efficacy against mechanical energy delivered by friction (several hundred grams in cm2). The true virtue of CXL lies in the brake on friction that it induces in patients (the eye operated is painful and sensitive in postoperative), not in any hardening. So, if you get your daughter to stop rubbing her eyes, the distortion will no longer progress. There is never an urgent need to carry out a CXL (for patients, I put aside the economic interests of structures that realize CXL often abusive... and that do not concern you). Monthly checks can be carried out at the beginning, and once again, if the removal of friction is effective, these controls will show the absence of progression of the deformation. You can check this by looking at many perfectly tracked and documented examples: You will find among these case common traits with your daughter (past allergic, restless or disturbed or reduced sleep, stress, Screens... All risk factors for eye irritation and friction). During the realization of the CXL, a small layer of superficial cells is removed called "epithelium". This is necessary for the riboflavin to permeate the layer called "stroma" before it is irradiated with UV. The epithelium attenuates a bit the deformation of the cornea, and when it is removed, a more distorted surface is stripped. It may take several weeks for the reformed epithelium to smooth the cornea surface. This may explain your current feelings. The first eye was certainly the most affected when you were operated, with a vision sufficiently altered so that you did not feel the difference between "with" and "without" epithelial resurfacing. There are other potential complications with CXL (haze, healing delay, etc.) and you have to make a point with your surgeon. To see the progress of the KC, can we ask to have the topographies because we do not currently have any? And in the case of a cornea transplant? How long is one "immobilized"? Your daughter needs to know which sleep position (s) she prefers. The protective eye shells are in pharmacy, they must be fixed with Micropore. It is indeed necessary to carry out successive topographies (preferably with the same machine) to judge a possible progression (in case to stop friction, there is no progression). After CXL, the eye is douloreux and inflammatory for several days. Sometimes it takes several weeks or months to find the same vision as before. This can have an impact on school and sports activities. Again, if we accept that the eye rubbing can be at the origin of the KC (our experience and logical findings strongly point to this dirtection), it is more important to stop the mechanisms (allergy, Irritations, sleep position, tics, etc.) than to consider an intervention which, in any case, does not protect the eyes from the action of friction. I have 26ans and I am reached with a very advanced keratoconus on the left eye (total blurred vision) and the right eye is reached also but not yet so serious. The doctor ordered me to do in emergency operation cross linking otherwise it may be that the right eye evolves to become like the left eye. He also said that it is possible to intervene with the left eye but the operation is very expensive. At first, it is necessary to make a thorough investigation of the eye rubbing and to stop these definitively. In our experience; Stopping frictions (which are the cause of the keratoconus) is enough to stop the evolution of it, it is not necessary then to carry out an operation. Sometimes it is also necessary to change its position of Sommmeil (if you sleep on the belly or the side with a support on the eyes when the head is against the mattress or pillow). If the eyes scratch a lot, eye drops can be prescribed to treat the cause of these itching. I have a keratoconus Diagnosed for about ten years. Of slow evolution, I have never worn rigid lenses, only glasses to correct my astigmatism. For a few months I have become myopic (6 and 8/10), and I am offered a CXL to recover in vision and stabilize the keratoconus . I'm 53 years old, what do you think? This approach is totally unjustified. On the one hand, the putative objective of the CXL is to "solidify" the cornea (which is not observed in most of the studies conducted "in vivo", however). On the other hand, even if the CXL was sufficient to harden the corneal tissue, it would not do enough to withstand the force inflicted by the eye rubbing . In order for a keratoconus to become stable, it is sufficient to lift the mechanical stresses exerted on the corneal dome; So stop rubbing your eyes, and also change its sleep position (avoid prolonged support on the eyes when you sleep on the belly or side). – > See here: https://defeatkeratoconus.com/eye-rubbing-tips/ Unfortunately, there are often unreasonable indications for the CXL, which is a non-complicating technique and which from my point of view is deleterious in the context of the keratoconus. It is not useful to add a photochemical trauma to a cornea already weakened by repeated mechanical trauma (friction). I am suffering from a corrected kératocone with glasses (5/10 OD and 9/10 OG after correction) for 10 years. I plan to switch to the lens on an ad hoc basis (to drive or play sports); But I wonder if the lenses also did not exert friction on the cornea. So is the port of this one not likely to aggravate my visual defect? The friction or pressure exerted by the rigid lens on the eye is negligible compared to the forces exerted by the friction (or even the weight of the head on the eye when one sleeps the head in the pillow). The lens can therefore only advance the distortion of the cornea. I am 19 years old and I have a beginner Keratoconus (for a year) and amblyopia to my OD. They tell me that the friction come the Keratoconus so I have not rubbed my od since last year but I always rub my og because I did not know that the friction are the cause, I made a topography 2 months ago and fortunately my Keratoconus did not have voluted in my OD, they tell me that OG is normal, but now I see halos and duplication even if I close my OD!! What do you think of this correction? do you think my OG is also affected by Keratoconus? If it is not achieved why I see halos and duplication even if I close my OD? will the halos disappear if I do a PKR? It is possible that by rubbing your left eye, you have trained a small deformation of the cornea, which can explain the perception of halos and slight duplication. The corneal topography is the necessary examination to verify this. In view of your correction, there is nothing serious a priori, and things will remain there (for the left eye) If you do not rub at all this eye. The correction of the right eye should be checked on the last prescription (the sign of astigmatism correction should be negative a priori).